Wedding cakes are among the most beautiful cakes in the world. They are used as great centerpieces for weddings. These are made to be incredibly elaborate with all sorts of tiers and color tones. The decorative accents that come with wedding cakes especially make them amazing to spot. You can certainly get the most out of a wedding cake if you just think about how you’re going to get it prepared. There are many good considerations that must be taken seriously as you only get one real chance to make the best possible wedding cake. When choosing your wedding cake, you need to think about the design that you want to work with. The design in particular should be memorable and unique but still easy for a baker to prepare. When chosen right, it should be very easy for your wedding cake to stand out. You can always consider a design based on things like how tall the cake will be, any accents that are to be placed on the side and the color of the cake. Think about as many aspects of your wedding cake as possible to give yourself an easier time with getting the most out of your cake. The design should be checked carefully regardless of how big it is. This leads into the next key point. A wedding cake is typically larger in size than that of any other cake out there. Much of this is to support the amazing design that you will opt for when getting your cake ready. The servings should be considered based on the number of people on the groom’s and bride’s sides. It helps to keep the number of servings as evenly as possible between the groom’s and bride’s sides assuming that the two have about the same number of people involved. The size of each tier in your cake can vary but the base should be at least ten inches from one end to the next. This can always be larger if the wedding party is bigger in size. You might consider offering seconds to people if desired. While typical wedding cakes are prepared to where each guest gets one slice, you should think about being generous. Don’t forget about the formality of the wedding. The slices cut at a more formal wedding are often rather small. Sometimes they are closer to one inch in size. A more informal venue might cut the cake with two-inch slices. The size of your cake deserves to be considered based on how it is made and how it will be cut. You have to look carefully to see that your cake is big enough and that the cutting is done in a sensible and responsible manner. 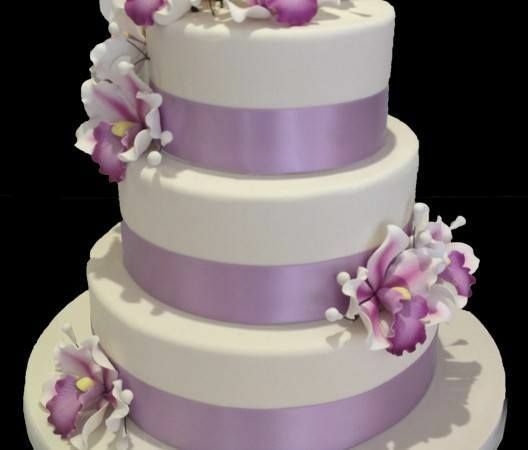 The top cake tier for your cake should be used as one between you and your new partner. The top cake tier should be enjoyed at your home after the wedding. This is used as a symbol of the wedding and the newfound union between you and your partner. A small box should be added with your cake for the top cake tier. Remember that this part of the cake should not be considered too much as it is not one that is going to be consumed by other people at the wedding. You should watch for how much you will spend on your cake. You will certainly have to pay more in order to get a better wedding cake. This comes as the more elaborate designs typically cost more money to use. A typical wedding cake can cost at least $400 in value. This is a high total that can prove to be prohibitive for many people. This could be even higher in some metropolitan areas with the cost being at least a thousand dollars. You should also consider the slicing based on the charges associated. Many venues will charge a per-slice cake-cutting fee. This is due to the precise nature of getting a proper cut going when getting each slice served. This fee can be good for at least a dollar per slice but some venues might charge at least five dollars per slice for this fee. The cost associated with cutting the cake can be rather difficult and prohibitive. You need to ensure you can actually afford the cost that comes with the cake but more importantly, you should try and negotiate a deal. A good deal could be established in a contract you set up with the venue and even the baker alike. The shape of your cake should be considered carefully. A traditional square or rectangular shape is clearly easier for a baker to make and therefore will cost less money. This could be a good choice for your wedding in terms of how the cake is baked and served. Still, a traditional shape might be too plain. You can always opt for a heart shape or any other unique shape for your cake if desired. Be prepared to spend an extra bit of time with getting this to work if you choose to go in this route. Be sure to prepare a tasting with whoever you are looking to have make your wedding cake. This can help you get a clear idea of how well a cake is made and whether it is of a proper flavor and texture to your preference. This should help you get the most out of your plans for getting your cake to work out quite well. Your wedding cake should be unique and special. Be sure when choosing your wedding cake that you know what to get out of it and that you have a clear idea of what will make it work. After all, this is not just any ordinary cake.